The Shedding Light on Atoms series gives students the perfect introduction to the world of atoms. Using amazing demonstrations and animations, we take students on a journey of discovery to explain not just what we know about atoms, but also how we know what we know about atoms! 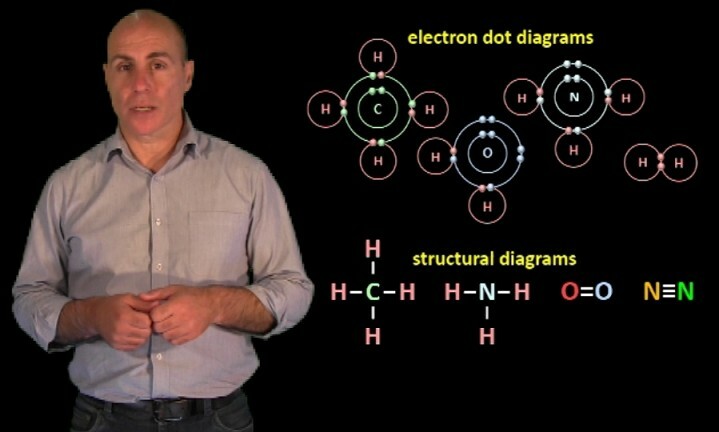 In Episode 7, Covalent Bonding, we look at how the atoms of non-metals bond together with covalent bonds to form molecules, introduce electron dot diagrams and structural formulas, explain how the electron configuration of an atom affects the number of bonds it can make, and finally introduce the topic of organic chemistry. The preview video below contains a 6-minute excerpt followed by a 1-minute trailer. Contents: Part A: Introduction: CH4 exists, but there’s no such thing as CH3, or CH2, or CH. Why is this? Why do atoms join together only in certain fixed ratios? Well, it has a lot to do with their electron configurations. Part B: My name is Bond, Covalent Bond: Covalent bonds form when pairs of electrons are mutually attracted by the nuclei of two different atoms. It’s often described as a sharing of electrons between two different atoms, but it’s really more like a tug-of-war. Atoms continue to bond with other atoms until their outer shells are full. “Electron dot diagrams” are used to represent molecules and the electron distribution within them. Part C: Single, Double, and Triple Bonds: Quite often, atoms can be held together with not just one shared pair of electrons, but with two and three shared pairs of electrons. 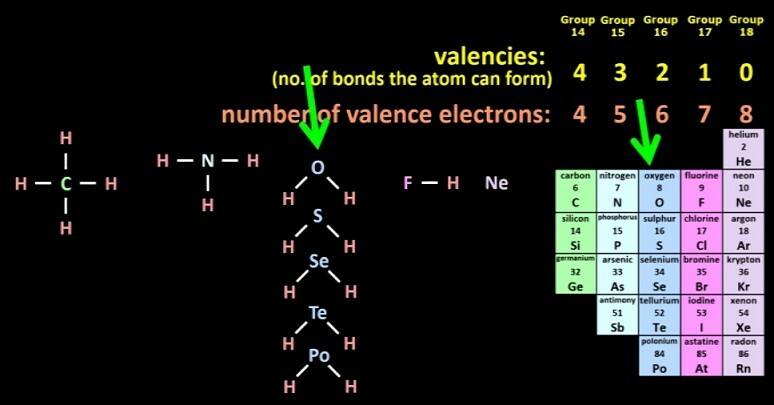 Part D: Valency: Atoms can form only a fixed number of bonds. The number is called the atom’s valency. Structural formulas allow us to represent molecules more easily than with electron dot diagrams. Part E: Working Out Structural Formulas: The study of “Organic Chemistry” (the study of compounds containing carbon atoms) allowed scientists in the mid-1800s to work out the formulas and structures of quite a few molecules. They even developed the idea of double and triple bonds some 50 years before electrons were even discovered! Part A: Introduction What exactly is a compound, well, when we are talking chemistry? By definition a compound is made up of two or more different types of atoms that have chemically joined together. The most well-known compound is water, which has the chemical formula H2O. Each so-called water molecule is made of 2 hydrogen atoms bonded to one oxygen atom, and since, as we’ve seen, atoms are really really small, a single wave of water contains trillions of these water molecules floating around each other. However, we haven’t yet covered how atoms bond together. What makes one atom stick to another atom? And why are only certain combinations possible? We’ve seen how, in the 1870s, Dmitri Mendeleev developed the Periodic Table based in part on the patterns in the way that atoms chemically react with hydrogen. Single carbon atoms for example always react with hydrogen atoms in a 1:4 ratio. 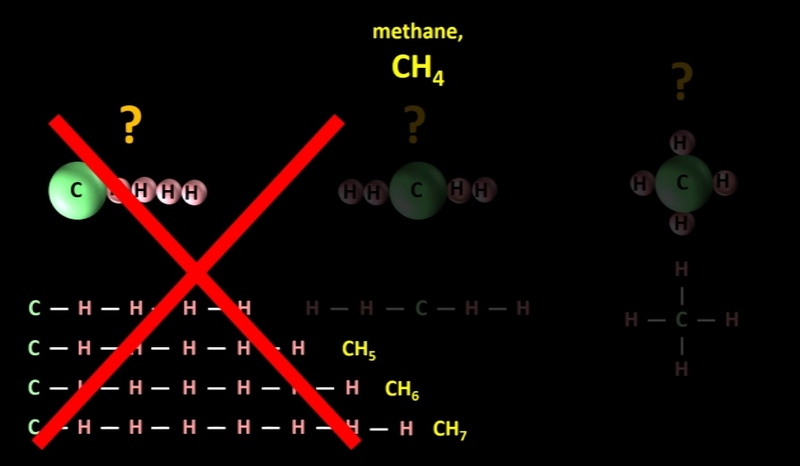 CH4 exists, methane, which is what natural gas is mostly made of, but there is no such thing as CH3, CH2, or CH. 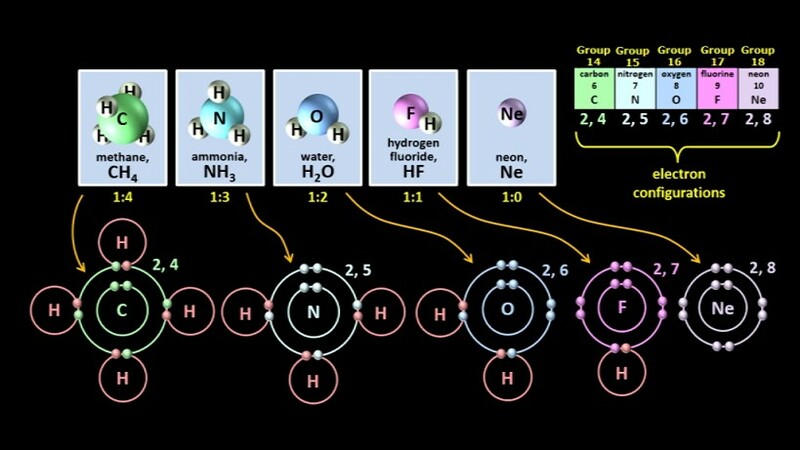 Single nitrogen atoms react with hydrogen atoms only in a 1:3 ratio, single oxygen atoms react with hydrogen atoms only in a 1:2 ratio and single fluorine atoms react with hydrogen atoms only in a 1:1 ratio. The atoms of Neon, don’t react with hydrogen atoms at all, or any atoms for that matter, so the ratio is 1:0, if you look at it mathematically. This pattern is exactly the same in the next period! We have SiH4, PH3, H2S, HCl and Ar. The explanation for why these patterns occur and for why atoms join together in the first place came only after protons, electrons and electron shells were discovered. We saw in or last episode that in the 1910s and 1920s, scientists were able to work out that electrons occupy only certain fixed energy levels, which were named electron shells. 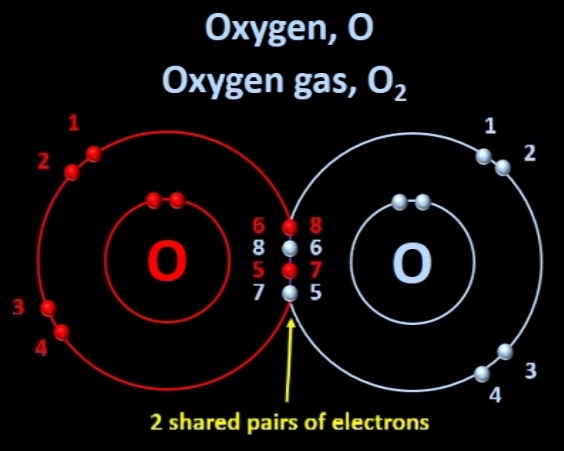 Oxygen atoms for example have 2 electron shells, and an electron configuration of 2, 6, because they have 2 electrons in their first shell and 6 electrons in their second or outer shell. Chlorine atoms, which have three electron shells, have an electron configuration of 2, 8, 7. The discovery of electron shells led directly to an explanation for how atoms join together in the way that they do. Notice how carbon atoms have 4 outer-shell electrons, nitrogen atoms have 5, oxygen atoms six, fluorine atoms 7 and neon atoms 8. So how is this pattern related to the 4, 3, 2, 1, 0 pattern along here? Well, 4 + 4 = 8, 3 + 5 = 8, 2 + 6 = 8, 1 + 7 = 8, and 0 + 8 = 8. That’s not a coincidence but a consequence of the electron configurations and we’ll see why very soon! It turns out that there are two ways that atoms join together to form compounds: atoms can form either what are called covalent bonds with other atoms, water is one example where this happens, or they can form what are called ionic bonds with other atoms, like they do in salt, NaCl. In this episode, we’re going to look at covalent bonds. So let’s begin. Part B: My Name is Bond. Covalent Bond. 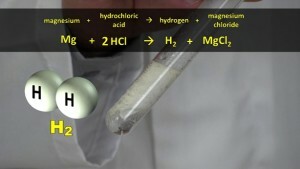 In this chemical reaction between hydrochloric acid and magnesium, hydrogen gas is being produced. In hydrogen gas, the hydrogen atoms always join up in pairs and we write the chemical formula as H2. So, the question is: why do hydrogen atoms always join up in pairs and what makes them join together? 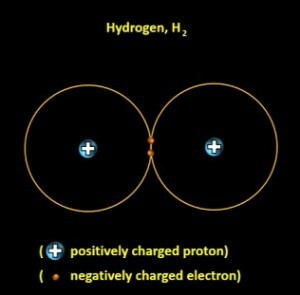 Let’s look at a simple diagram of a hydrogen atom. It has one positively charged proton in its nucleus, well, the proton is in this case its nucleus, and the negatively charged electron moves around the nucleus at really high speeds. There is a force of attraction between the proton and the electron since they have opposite charges. Let’s simplify things further by just showing the electron stationary in its electron shell. Now the proton here is attracting the electron, but that doesn’t mean that it can’t also attract another electron that’s part of another hydrogen atom. If a second H atom happens to come along and it bumps into our first H atom, then our original proton will also attract the electron of the second H atom. Now that also means that the proton of our second H atom is close enough to attract the electron of the first H atom, so it becomes a kind of two way tug of war, because the pair of electrons is attracted by both of the nuclei. As a result the atoms bond together in a stable arrangement and they stay together. This type of bonding, where pairs of electrons are mutually attracted by the nuclei of two different atoms is called covalent bonding. A molecule, by definition, is any group of two or more atoms that are held together by covalent bonds. It’s a bit like two hobbitses fighting over a ring. They both wants it and neither wants to let go so the two hobbitses are bound together by their mutual attraction to the “precious”. (Lord of the Rings reference!) However, unlike a fight over the One Ring, the tug of war between the atoms nearly always involves two rings er, two electrons, one from each atom. So now each electron shell doesn’t have just one electron in it, each electron shell has two electrons in it: its original electron and the one that has been attracted. 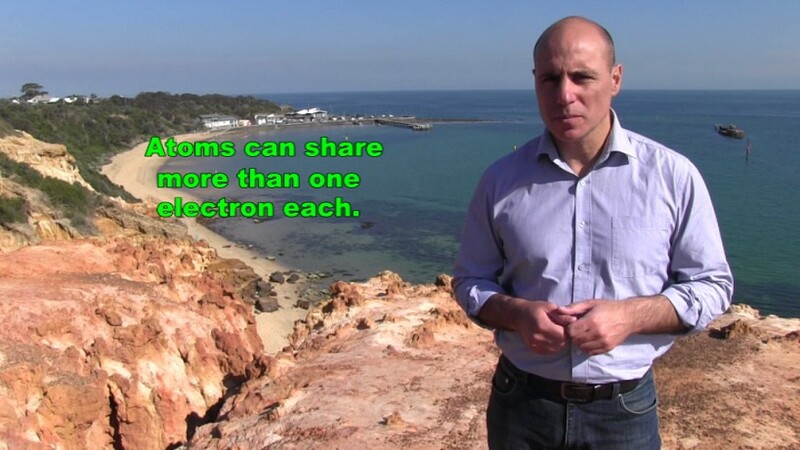 As we saw in our last episode, 2 is the maximum number of electrons that the first shell of an atom can actually hold, so both electron shells are now “full”. It turns out that having a full outer shell is particularly stable, and atoms tend to chemically react with other atoms until their outer shells are full. Hydrogen atoms therefore never exist on their own. As soon as individual H atoms are produced in a chemical reaction they link up in pairs, so hydrogen as a gas is always H2. The electrons of course are constantly moving in a kind of figure eight orbit, but we usually just represent the electron arrangement like this because it’s so much easier. So what happens if a third hydrogen atom comes along? Well, its electron is repelled by the two electrons that are already there and no reaction takes place. Of course, that’s not to say that hydrogen gas isn’t reactive. 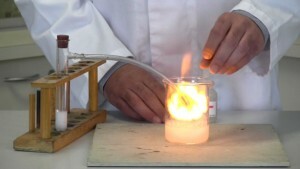 As we saw in Episode 2 of our series, it’s flammable, which means it is reactive, and explosive in fact if you also mix it with a lot of oxygen. But you have to heat it up with, say, a burning match before it’ll start to burn, because H2 molecules are a whole lot less reactive than single hydrogen atoms, which join together as soon as they’re produced in a chemical reaction. 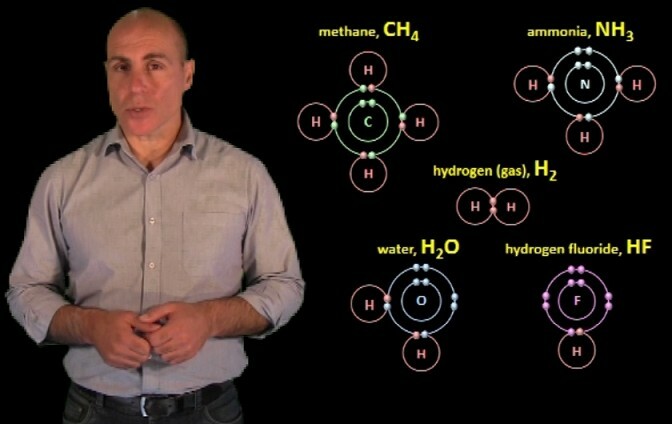 Hydrogen molecules, H2, are the simplest of all molecules. So, in summary, a covalent bond is a chemical bond that forms between two atoms when they attract each other’s electrons into their own shells. The force between protons and electrons is called the electrostatic force. Let’s look at water, a slightly more complicated example. Now even though all electrons are identical, we’ll colour code them so that you can more easily see what’s going on. Oxygen has two electrons in its inner shell and six electrons in its outer shell. However, the outer shell can hold a maximum of eight electrons. If a hydrogen atom crashes into it, the hydrogen atom’s nucleus attracts this electron into its electron shell and the oxygen atom’s nucleus attracts this electron into its outer shell and the two atoms form a bond. However, the oxygen atom’s outer shell can hold one more electron, since right now, it only has seven, six blue and one pink. An atom with seven electrons in its outer shell is just not stable (that is, it’s very very reactive). 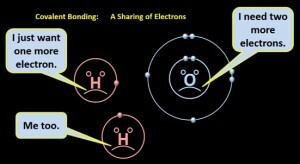 If another hydrogen atom comes close, the two nuclei attract each other’s electrons and another bond is formed. The oxygen atom now has eight outer-shell electrons, the six original blue electrons that it had, plus the two pink ones that it managed to attract. This is the maximum number that it can hold: The hydrogen atoms now have 2 electrons in their outer shells: the pink ones they started with and the blue ones that they’ve attracted, and so their shells are full as well. This arrangement is stable. 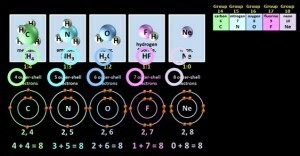 In fact whenever atoms bond covalently with other atoms to form molecules, they end up with eight electrons in their outer shells, with the exception only of hydrogen atoms, which end up with two. Eight just seems to be a particularly stable number for most atoms and we’ll look at a few more examples soon. In a water molecule, each oxygen atom forms two bonds and each hydrogen atom forms one bond. 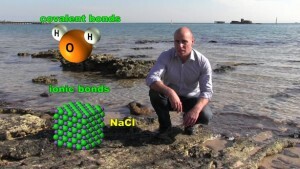 And what happens if a third hydrogen atoms bumps into our H2O molecule? Well, it doesn’t chemically react because all the outer shells are already full of electrons, and no more electrons can fit in. And that’s why there’s no such thing as H3O or H4O for example. 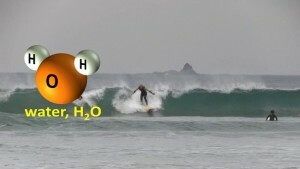 Once again, a stable arrangement of electrons doesn’t mean that water molecules, or any molecules, never react. 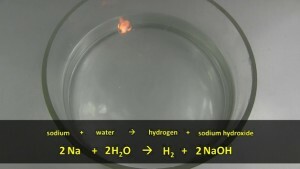 Here water is reacting with sodium. However, water molecules are a whole lot less reactive than single oxygen atoms or single hydrogen atoms which basically never exist on their own. Diagrams like these ones are called electron dot diagrams or electron dot structures. 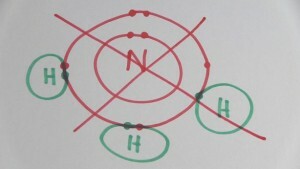 My original animation showed the H atoms’ protons, but it’s better of course to simply write the atomic symbol. Now even though the way an atom chemically reacts is affected by its nucleus and all of its electrons, the outer shell plays a particularly important role, so it was given the special name of the “valence” shell. 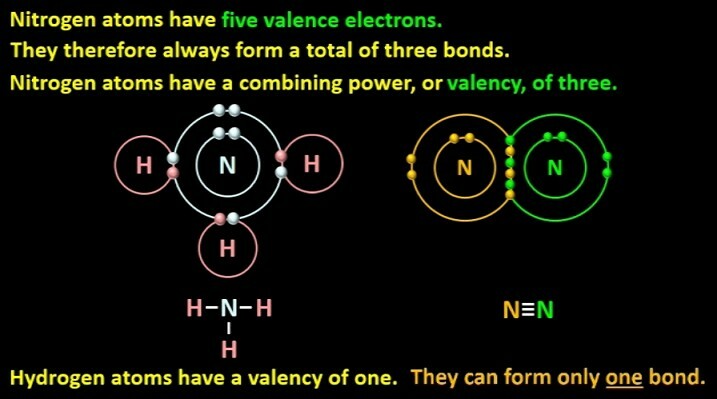 The word valence comes from the Latin word for power, and it relates to the combining power of the atom, that is how many bonds it can form with other atoms. More on this a little bit later. Electrons that occupy the valence shell are called valence electrons. So in the word “covalent”, “valent” of course comes from the word valence while “co” means together, like it does in words like co-operate or co-worker. “Covalent” refers to the fact that the electrons can be in two different valence shells at the same time! 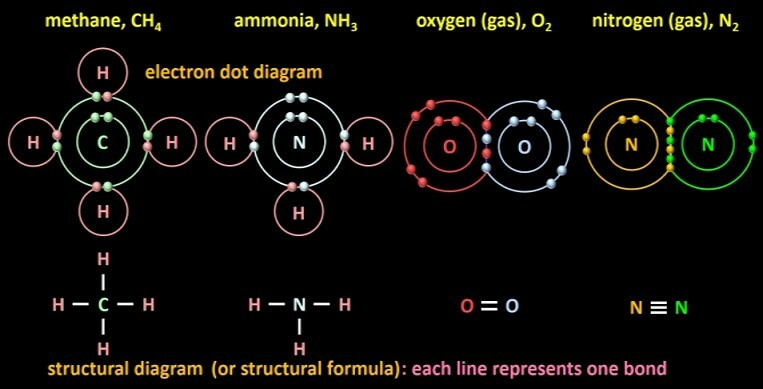 Let’s actually draw an electron dot diagram for ammonia. 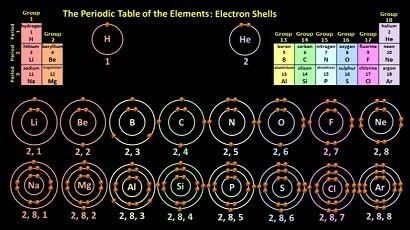 We’ll begin by drawing a nitrogen atom, which has two electrons in its first shell and 5 electrons in its valence shell. This leaves space for three more electrons, which are supplied by three hydrogen atoms. The nitrogen atom’s valence shell ends up with eight electrons in it: the five red ones plus the three green ones. The three hydrogen atoms end up with two electrons in their valence shells, which makes them full as well. So everyone’s happy. Well, everything is stable. 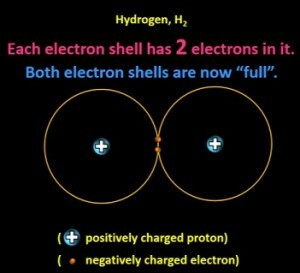 Now you also have to make sure that each of the shared electrons is in both shells. In this diagram each shared green and red electron is in two shells. If you draw something like this, then the nitrogen atom has eight electrons in its outer shell, but this hydrogen atom still has only one electron. In other words, it’s wrong. nitrogen + hydrogen → ammonia N2 + 3H2 → 2NH3. And why is it such a big industry? Apart from CO2, water and sunlight which plants need for photosynthesis, plants also need small amounts of nitrogen-containing compounds to grow. 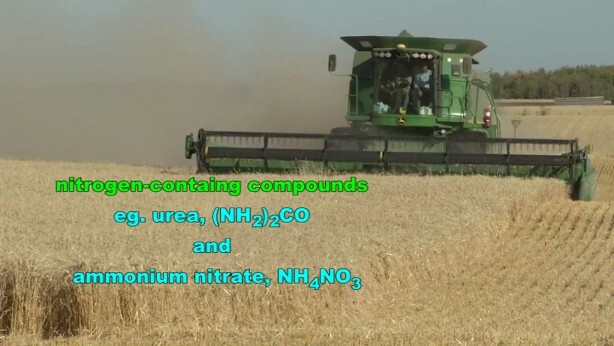 Though normal soil contains these compounds, they get used up when land is used to grow crops, so nitrogen-containing fertilizers have to be added to the soil to maintain good growth. Currently, about 15% of the Earth’s land is used for farming, but without the artificially produced fertilizers that are made from artificially produced ammonia, it’s estimated that we would need to use up about 50% of the Earth’s land for farming. Nitrogen atoms are a key part of the proteins that make up all living things. Nitrogen atoms present in our proteins make up about 3% of the human body’s mass. Plants need the nitrogen atoms in fertilizers to grow since they can’t use the nitrogen directly from the air. Chemistry isn’t just about what happen in a lab, it has real-world applications! But let’s get back to bonding. Group 16 elements have 6 valence electrons just like oxygen does, they usually react with other atoms to produce compounds with similar formulas. All of the examples we’ve shown so far involve hydrogen atoms, but covalent bonds form between any non-metals. Fluorine atoms, for example, have 7 valence electrons. 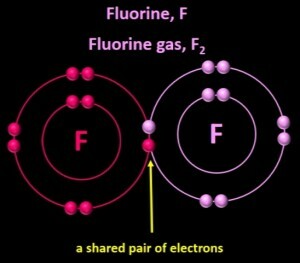 If individual fluorine atoms are produced in a chemical reaction, they crash into each other and bond covalently, to produce F2. By, as we say, sharing a pair of electrons, each fluorine atom now has eight electrons in its valence shell, its original seven plus one from the other atom. Quite often, atoms can share, or start a tug of war with, more than one electron each. This happens in, for example, gaseous oxygen, O2. An oxygen atom, as we’ve seen, has six valence electrons, so when it bonds to another one, they each share, or start a tug of war with, two electrons each which results in each oxygen atom having eight valence electrons and making the O2 molecule stable. The blue-coloured oxygen atom has its 6 original valence electrons plus two more red electrons, giving it a total of 8 valence electrons. The red-coloured oxygen atom’s valence shell also has its 6 original valence electrons and it now has two blue ones as well, again making a total of eight. Now, once again, just because this O2 arrangement is stable, doesn’t mean that oxygen gas is unreactive. Fire is caused by the chemical reaction of a fuel with oxygen gas. 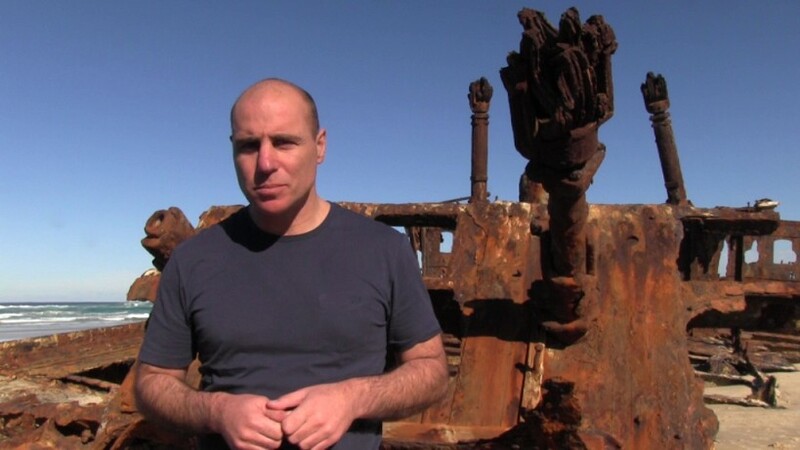 Oxygen in the air can also chemically react with iron to produce rust. However, O2 molecules are a lot less reactive than single oxygen atoms which are so reactive that they basically don’t ever exist on their own. 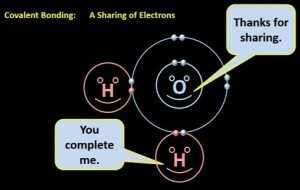 When only one pair of electrons is shared, the bond is called a single bond. When two pairs of electrons are shared, the bond is called a double bond. You can also have triple bonds. Gaseous nitrogen, N2, the gas that makes up about 4/5 of our atmosphere is made of pairs of nitrogen atoms that share 3 pairs of electrons. Nitrogen atoms, as we’ve seen, have an electron configuration of 2, 5, so they typically acquire three more electrons in their valence shells to become part of a stable molecule. In the N2 molecule, each nitrogen atom’s valence shell contains the five electrons it started with plus three electrons from the other atom, making a total of eight. This bond is called a triple bond because there are three shared pairs of electrons. Now even though hydrogen gas, oxygen gas and nitrogen gas are made up of pairs of atoms which are held together by single, double and triple bonds, they are still considered elements. An element, by definition, is made up of only one type of atom. The fact that the atoms are joined in pairs doesn’t matter. Compounds, on the other hand, like water, ammonia, and methane are made up of different types of atoms which have bonded together. You can download this transcript as a pdf here and the Question Sheet as a pdf here.While the text and pictures present the ideas reasonably well, nothing beats watching the actual program! 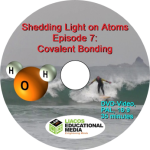 Shedding Light on Atoms Episode 7: Covalent Bonding only $49.99. Grab the entire eight-part Shedding Light on Atoms Series for only $239.92. It’s a 40% saving! 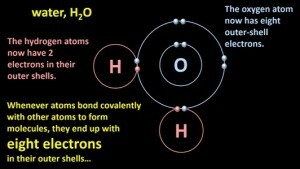 A very rough concept of the covalent bond was first introduced by US scientist Gilbert Lewis in about 1902, more than ten years before electron shells were actually discovered. To explain why atoms joined together only in certain combinations, he pictured cubical atoms which could have electrons at each vertex. A fluorine atom for example could be represented as a cube with electrons at seven of the cube’s eight vertices. 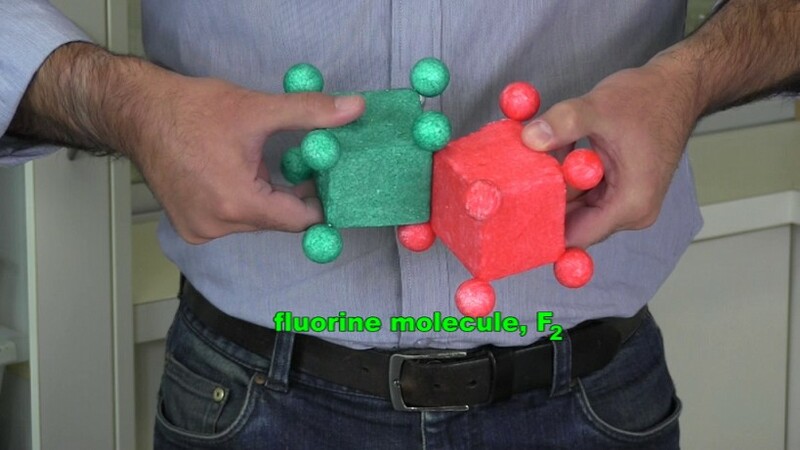 By linking with another fluorine atom, which also had 7 electrons, to produce F2, the two cubes ended up with eight electrons each, with a pair being shared, and this, Lewis said, provided stability. Lewis didn’t have any direct evidence that electrons did arrange themselves into these groups of eight and he certainly didn’t claim that he knew for sure that this is what happens, but never-the-less his diagrams could be used to explain the chemical formulas of lots of compounds. 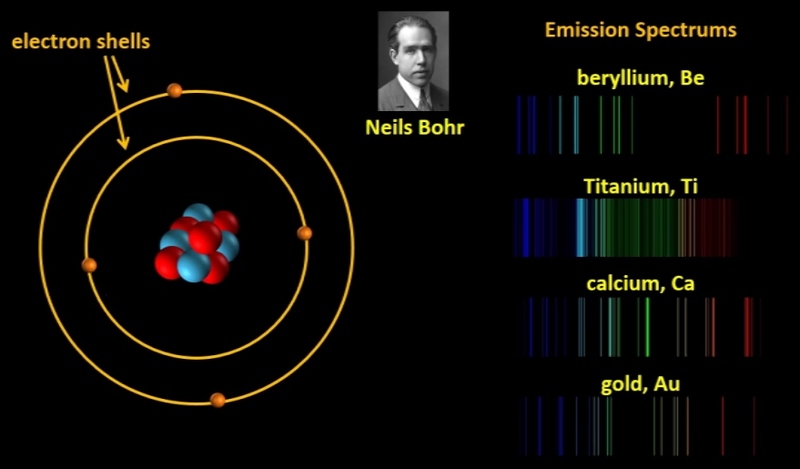 Eventually, as we saw in our last episode, Neils Bohr developed his theory of electron shells which was based on analysing emission spectrums, and Lewis’s ideas were confirmed. We also saw in our last episode how in the 1910s, Australian scientist William Bragg developed a way of analysing the patterns produced when X-rays passed through various compounds and he was able to work out how the atoms were arranged in the compounds. This technique, called X-ray crystallography by the way, became so accurate that scientists were even able to work out where the electrons were in a compound and so they confirmed the fact that in molecules, electrons can be shared by two different atoms. Gilbert Lewis’s diagrams later developed into the kinds of electron-dot diagrams that we use today. In 1919, US scientist Irving Langmuir further developed Lewis’s theories and introduced the word “covalence”. However, there is another way of drawing diagrams of molecules. Methane’s electron-dot diagram looks like this. Now that you know how the electrons are arranged in molecules, we can simplify things by representing each shared pair of electrons with a single line. This so-called structural diagram (or structural formula), shows the four covalent bonds that the carbon atom has formed with the four hydrogen atoms. I’ll say it again, each line represents one bond or in other words, a shared pair of electrons. The electrons in the inner shell of the carbon atom are not shown. A molecule of ammonia, NH3, can be drawn as a structural diagram like this. 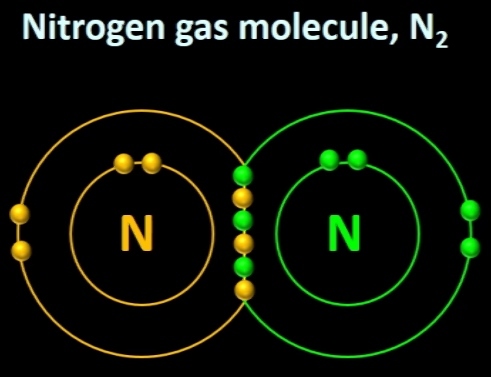 The nitrogen atom has formed three bonds, while the hydrogen atoms have formed one each. Sometimes the two unbonded electrons are shown in a structural diagram, but they’re usually left out. Double bonds, like those found in O2, are drawn with two lines, because, as I said, each line represents a shared pair of electrons. Again, sometimes the unbonded electrons are drawn in, but they’re usually left out. And how do we draw a triple bond, like those found in N2 molecules? Well, fairly logically, we draw three lines between the atoms. Structural diagrams are fairly easy to draw as long as you draw each atom with the correct number of bonds. Now as I said earlier, the word “valence” comes from the Latin word for power. In Chemistry it refers to the combining power of an atom, or in other words, how many bonds the atom can make. Since all nitrogen atoms have five valence electrons, that is five electrons in their outer shells, they acquire, through bonding, three more electrons to make a total of eight. 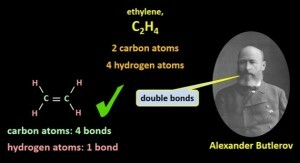 They therefore always form a total of three bonds. This ability to form three bonds is referred to as nitrogen’s valence or its valency. Valence is more common in US English, while valency is more common in UK English, but both are completely acceptable everywhere. I’m going to use the word valency from now on. So, we say that nitrogen atoms have a combining power, or valency, of three. And it’s not just hydrogen atoms of course that they bond with. They form three bonds whenever they become part of any molecule, N2 for example. So I’ll say it one more time: Nitrogen atoms have five valence electrons which gives them a valency of three. 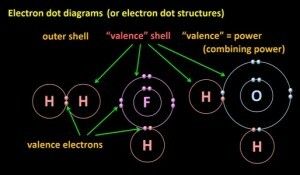 A hydrogen atom has only 1 valence electron, and it can only acquire one more electron before its valence shell is full. 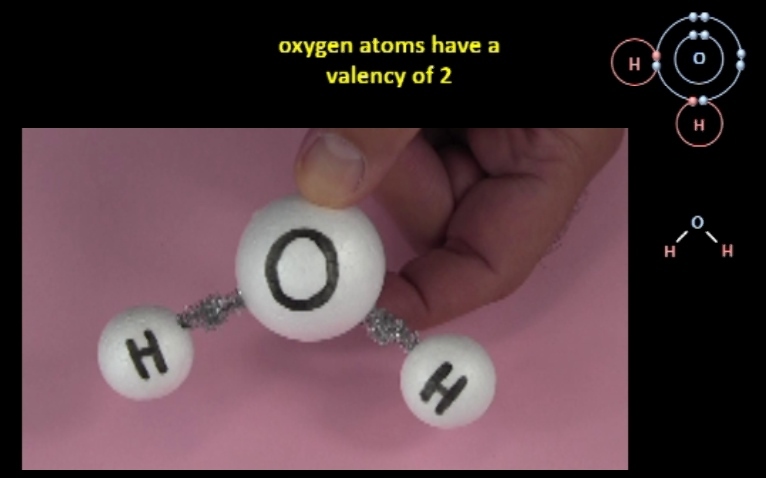 Hydrogen atoms therefore have a valency of only one because they can form only one bond. It’s almost as if all nitrogen atoms have 3 hooks and all hydrogen atoms have 1 hook. Atoms tend to hook up with other atoms until all their hooks are linked up. So in a structural diagram, nitrogen atoms should always be drawn with three lines or bonds coming out of them linking them to other atoms, while hydrogen atoms, should only ever be drawn in a structural diagram with one line or bond coming out of them linking them to another atom. 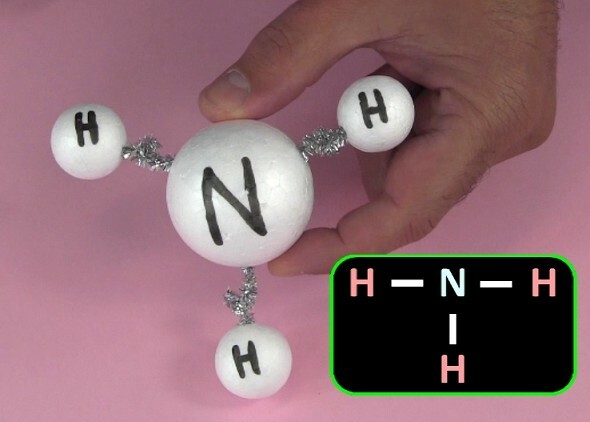 NH3 exists, but there’s no such thing as NH2 or NH for example, because these nitrogen atoms haven’t formed the right number of bonds. Since carbon atoms can acquire four more electrons to end up with a full outer shell of eight, they are said to have a valency of four. They should always be drawn in structural diagrams with four bonds. Oxygen atoms, with six valence electrons, can acquire only two more electrons, and so they can only form two bonds. They have a valency of two and should always be drawn with two bonds. Fluorine atoms which have seven valence electrons have a valency of one, and neon atoms, which have eight valence electrons have a valency of zero. So looking at the non-metals on the Periodic Table from Groups 14 to 18, the valencies of the atoms are 4, 3, 2, 1, and 0. In fact, since all the atoms within each of these Groups have the same number of valence electrons, they all have the same valency. For example all Group 16 elements have 6 valence electrons and so they all have a valency of 2. Now in this program, I first told you how to draw electron-dot diagrams and then introduced structural diagrams. In fact, structural diagrams started being used in the 1850s, some 50 years before electrons were even discovered. So how was that possible? Well, it came down to some brilliant chemistry and some very clever thinking. Working away in laboratories much like this one, scientists like Justus Liebig, Friedrich Wohler, Jean-Baptiste André Dumas and many others, had, by the 1850s, worked out the chemical formulas for lots of molecules, but the way the atoms were arranged in the molecules was unknown. 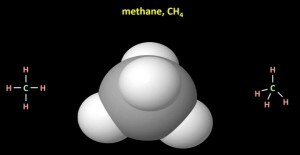 Were the atoms in methane, CH4, for example, arranged like this (CHHHH), like this (HHCHH), or like this (proper way)? 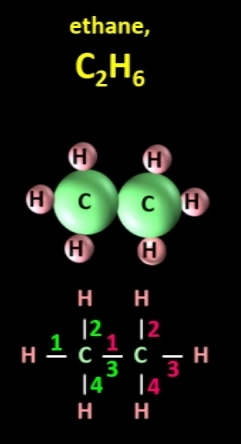 In these arrangements, these H atoms are bonded to only one other atom, but these H atoms are bonded to two other atoms. This seemed inconsistent. If the atoms were arranged like this, for example, then presumably you could also have CH5, CH6, CH7 and so on, but no compounds were known to have these formulas. 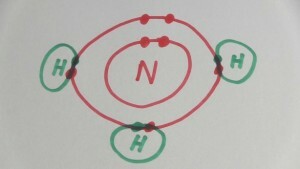 However in this model, all the H atoms make only one bond. It made sense to the scientists of the 1850s that atoms wouldn’t make some random number of bonds; each atom would more likely form a specific number of bonds so this arrangement therefore seemed most likely. 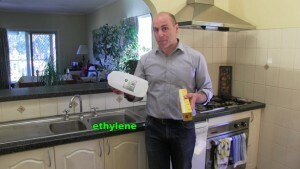 Now ethylene, also called ethene, C2H4, the gas which is now used in the production of polyethylene plastic, the most widely used plastic on Earth, presented a problem. How are the 2 carbon and 4 hydrogen atoms arranged in ethylene so as to allow each carbon atom to have four bonds and each hydrogen atom to have one bond? There was no obvious solution at first, but then Russian scientist Alexander Butlerov suggested in the late 1850s that atoms can form double bonds and so now each carbon once again shows a valency of four… and once again each hydrogen atom shows a valency of 1. Now compounds made only of carbon and hydrogen atoms are called hydrocarbons. There are thousands of examples. But how were their formulas worked out? Well, it turns out that all hydrocarbons, like methane, produce carbon dioxide and water when they burn. Different hydrocarbons produce different amounts of carbon dioxide and water. By determining the mass of the products, it’s possible to work backwards and to determine the chemical formula of the hydrocarbon that you burned. 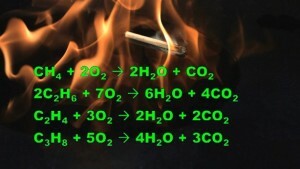 So how did they work out how much CO2 and H2O were produced when hydrocarbons burned? One way of measuring the mass of a quantity of gas is to pump it into some kind of container and then find the change in mass of the container. This ball, which is fairly flat, has a mass of 416g. If I pump air into it until it’s fully pumped up and then reweigh it, its mass increases to 428g a rise of 12g. 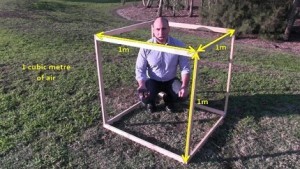 It turns out that 1 cubic metre (that is 1m x 1m x 1m) of air at normal pressure has a mass of only about 1.2 kilograms. Or in other words, the density of air is about 1.2 kg/m3. Carbon dioxide has a density of about 2 kg/m3 (1.98 kg/m3). A cubic metre of water though has a mass of 1000kg (1 tonne). Since gases are so light, directly measuring the mass of a gas produced in a chemical reaction was difficult. It could be done, but it was difficult. So, scientists turned to chemistry to help them. Rather than weighing a gas directly in, say, a test tube, you can pass the gas into a chemical that absorbs it and then measure the change in mass of the chemical. This is limewater which has the ability to absorb carbon dioxide. 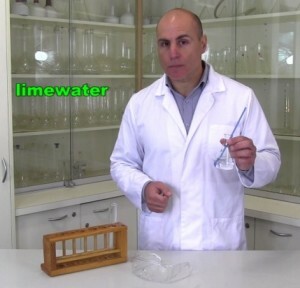 Limewater is water with calcium hydroxide dissolved in it. 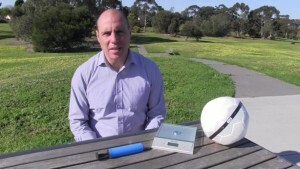 The flask and limewater have an initial combined mass of 126.075g. If I use a straw and blow into the limewater, the carbon dioxide coming from my body chemically reacts with the calcium hydroxide and produces calcium carbonate, which is a white powder and which turns the limewater a milky white colour. The oxygen, nitrogen and other gases in my breath pass through the limewater unaffected. If I place the flask down for about 10 minutes, the calcium carbonate that was produced settles to the bottom. When I reweigh the conical flask and its contents, we can see that the mass has increased to 126.288g. 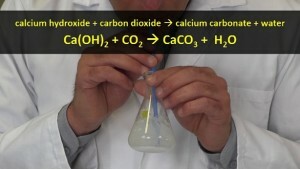 This increase of 0.213 g has come from the CO2 that has been absorbed. Other chemicals were known to absorb water in a similar kind of way. So, by burning a fixed amount of a hydrocarbon in a container while oxygen is pumped in from the side, the products, CO2 and H2O, could be collected and weighed. 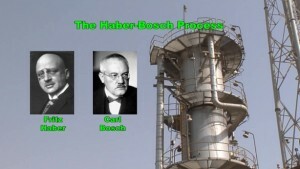 The hydrocarbon’s formula could then be calculated. 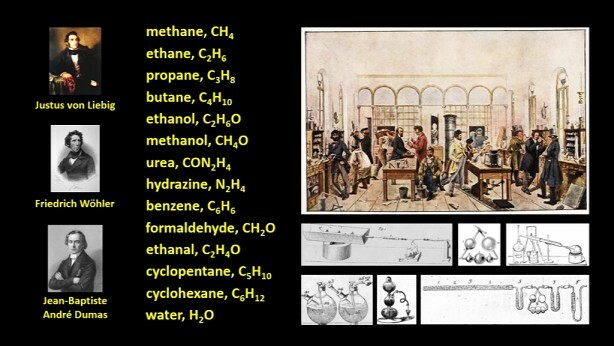 It was pretty complicated stuff, and I’ve only explained the basics, but the thousands of experiments that scientists were performing revealed a lot of information about not just hydrocarbons, but lots of other types of compounds as well. Ethanol for example, the type of alcohol found in wine, was found to have the formula C2H6O. Once a molecule’s formula was known, working out its structural formula was a little like solving a jigsaw puzzle. 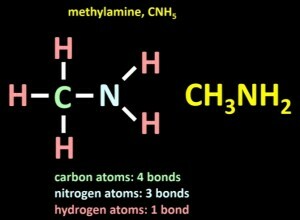 The gas methyl amine, for example, was found to have the formula CNH5. How do you arrange 1 C, 1 N and 5 H atoms such that each atom’s valency is satisfied? Let’s start with the C and attach three of the Hs. This leaves room for the N to attach, and we can then attach the last two Hs. 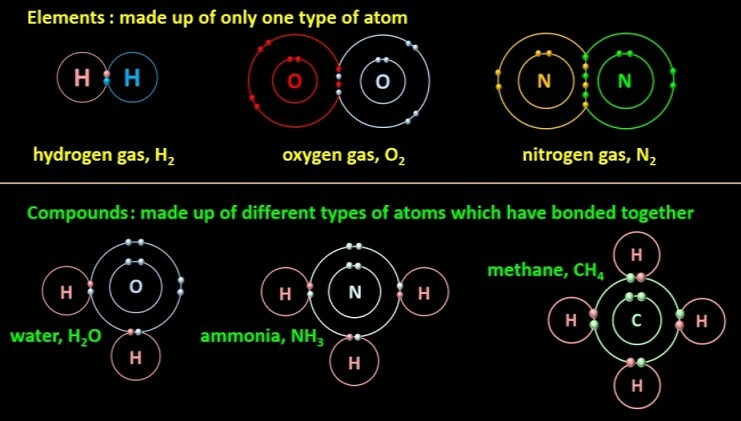 Now all the atoms have made the correct number of bonds: four for the carbon atom, three for the nitrogen atom, and one for each of the hydrogen atoms. No other combination is possible. The formula is actually now always written as CH3NH2, because this gives you an idea of where the atoms are. By the way, since carbon atoms were found to be in a huge number of molecules, the study of chemistry dealing with carbon compounds was given its own name: it’s called organic chemistry. No-one of course knew how atoms joined together until electrons and electron shells were discovered, after which the reason for each atom having a definite valency became pretty clear. After William Bragg developed the technique of X-ray crystallography, scientists were able to get a clear idea of the structure of even complex molecules. Though we’ve been drawing structural diagrams that are kind of flat, in reality molecules are 3D of course, and there’s usually a little bit of overlap of the atoms. 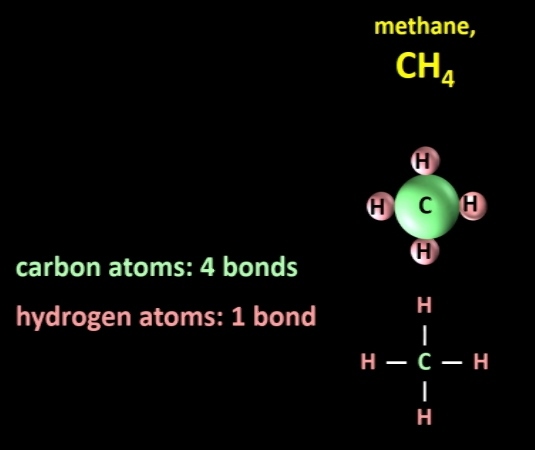 A methane molecule isn’t really cross shaped, it actually has more of a pyramid shape, so the structural diagram is often drawn with the bonds at an angle to try to give it a 3D look, but this isn’t essential. Our knowledge of (a) how atoms bond together covalently and (b) the shapes that molecules form when atoms do bond has completely transformed our world. It has given us a much better understanding of how our bodies work, and has allowed us to produce ever-more-effective medicines. We now have better fuels which burn more cleanly, stronger concrete, more powerful computer chips and electronic equipment, better plastics, better paints, and a whole lot more. However, more or less at the same time that covalent bonds were discovered, it was also discovered that atoms in a compound can also be held together with what we call ionic bonds. 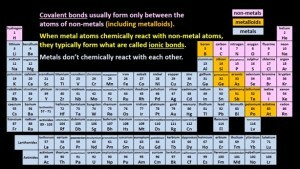 While covalent bonds, which usually form between non-metals, are often described as the sharing of electrons, ionic bonds, which form between metals and non-metals, involve the outright theft of electrons. It’s these ionic bonds that we’ll be looking at in our next episode. See you then. No hobbits were harmed in the making of this video. Hobbits are a fictional humanoid race invented by J.R.R. Tolkien. Hobbits: George Renieris and Johnny Stavrinidis (who were quite attracted to their roles). Thanks to the Chemistry Cultural Collection, School of Chemistry, University of Melbourne (for the X-ray crystallography image). 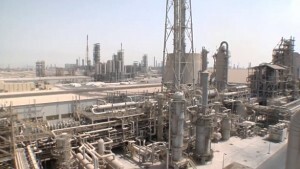 Ammonia production footage © ThyssenKrupp Industrial Solutions AG. Used with permission. Wheat farming and fertilizers footage © Agrium Inc. Used with permission. 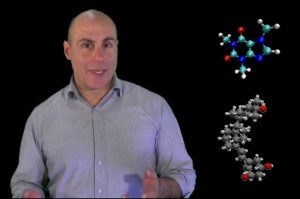 “Build a Molecule” created by PhET Interactive Simulations, University of Colorado, Boulder, http://phet.colorado.edu. Licensed under CC-BY.